← Calling at the Albany to see Graham Greene. 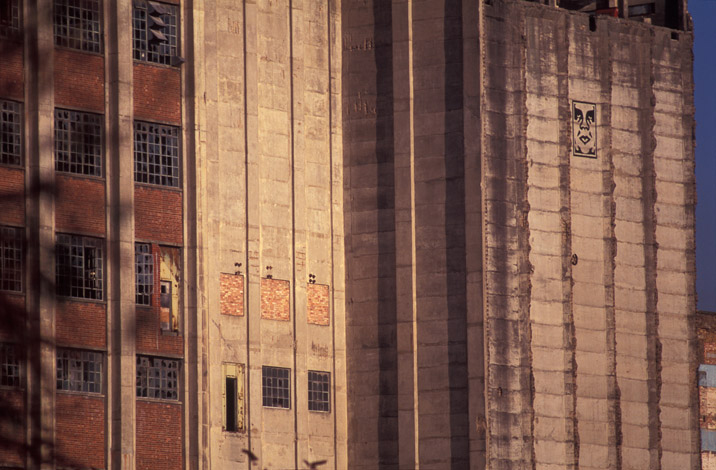 Millennium Mills. © David Secombe 2013. East Ham. I’m still only in East Ham. I walk down the cracked concrete road under an arborial sky on the road to Vietnam in all its artifice. The derelict gas works is dressed with imported Spanish palm trees hanging their heads, famished in a cold climate. The wrong choppers and the wrong soldiers. A bellicose nest of English squaddies squat in a huge marquee, drinking tea and intermittently stuffing their faces with carbs and gravy. Further still from here the final act is played out, the monolith that is Millennium Mills made of indestructible stuff: concrete and thick muscle-studded girders and lots and lots of asbestos. Made of all these things yet held together with an austere elegance. She casts a shadow of disdain across the ticky-tacky Barrett homes that now blister one side of the elegant watery fingers of Albert Docks. I left the day I arrived, after a morning of basic drilling, Sgt. Lee Ermey’s venom still damp on my face. I walked back the way I came. I was a kid. I didn’t know any better, I didn’t know Kubrick was one of my favourite directors. I kicked my heels walking slowly down the road. I’ve been kicking myself ever since. Micheal – who was a young dance student at the time – was engaged as a ‘marine’ extra on Stanley Kubrick’s Vietnam epic Full Metal Jacket, which recreated Saigon and Hue in East Ham. The unit base was at Millennium Mills. Lee Ermey played the drill sergeant in the film, having been originally hired as a military adviser.